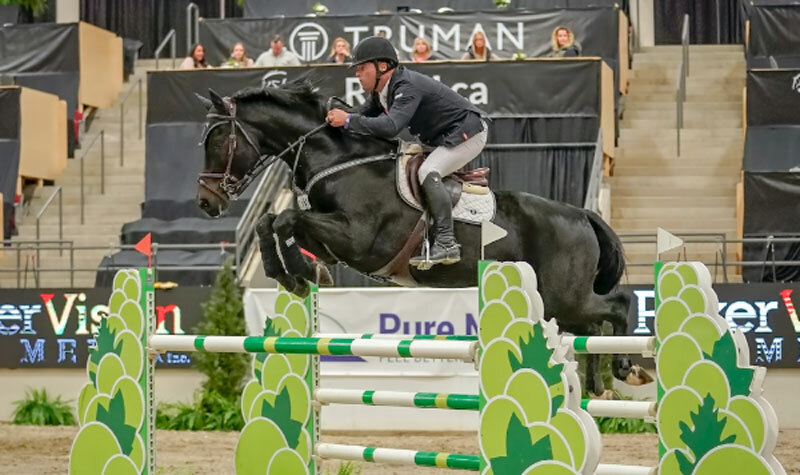 Kyle King and Escudo's Triumph winners of the $35,500 Camelot Cup. Photo by Amanda Ubell Photography. The 5th Annual Royal West tournament began with excitement, showcasing riders from North America and beyond in the $35,500 Camelot Cup 1.45m CSI2* presented by Poker Vision Media Inc. Werner Deeg designed the first Grand Prix course of the tournament, which asked riders and their horses to be quick and careful. The speed class consisted of 13 jumping efforts with few opportunities to use an inside turn to make up lost time. Majority of riders, including our winner – Kyle King of Ocala, FL, aboard Escudo’s Triumph – took all the opportunities they could find in attempt to end the evening on the podium. King had an early lead by taking on his first mount, Giorgio Van’t Hagenhof but was promptly over taken by Canadian Yann Candele aboard Granit S. “[Candele] took away the lead quickly but I knew I was only two seconds off,” said King “I used [Candele]’s round as well as the rest of the class to gage a plan for Escudo’s Triumph, my final horse”. Kelly Keller of Poker Vision Media Inc, and his daughter with John Anderson presenting Kyle King winner of the $35,500 Camelot Cup.